PURPOSE: Commissioned to design and paint mural with Kenyan students Grades 7&8 to inspire younger students toward educational excellence. MAJOR TAKEAWAY: Hold your own ideas of design loosely. Discover what voices most need to be validated to accomplish the goals of project and ensure they are heard. Sometimes the correct response is to pause. Nuru International is a nonprofit working to end extreme poverty in remote, rural areas by equipping local leadership in the 4 areas of agriculture, financial inclusion, healthcare, and education. 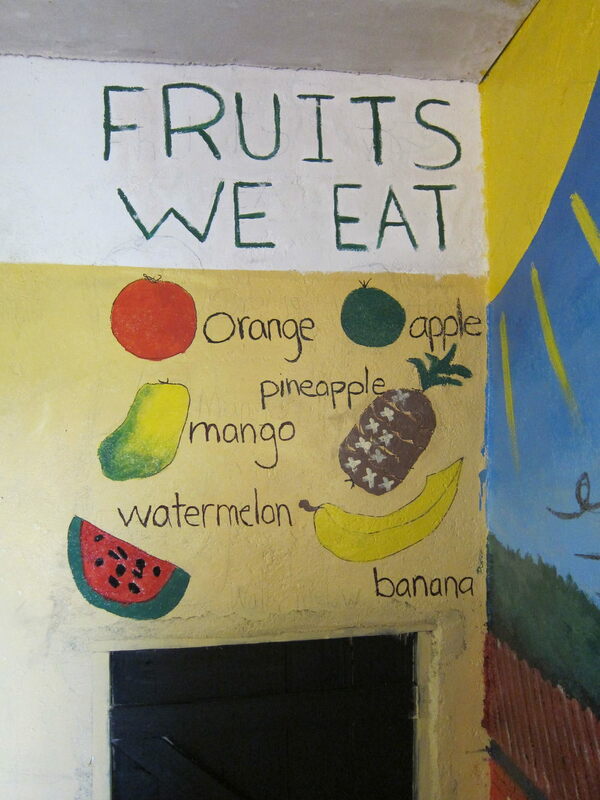 While working with a school in the Kuria District of Kenya, they contracted me to orchestrate the the painting of a mural by the primary students in grades 7 and 8 in order to include them in the renovations of the Kindergarten classroom. Their vision was for the older students to inspire the younger ones with the mural emphasizing the important role that education would play in increasing their quality of life. I was in Kenya for eight days. I had contacted the Education Specialist I was working with at Nuru and requested that the students write about why they thought education was important. My first day, I attended a gathering of the students in grades 7 and 8 and the school staff and they presented to me their written essays. Some students were chosen to perform their essays to the group as speeches and two boys performed a song which they had written. We then did a drawing activity. Each student drew a line down the center of a piece of paper. On the left side we wrote “Life with Education” at the top. On the right, we wrote “Life without Education.” The students were asked to draw their vision of what their own life would look like with an education and without. At the conclusion of the day, I had and abundance of input, both visual images and written ideas, to create a design for the mural. The next day we gathered the teaching staff and the Head Mistress of the school to view the design. I had sketched out a mural which would cover all 4 walls of the classroom. I used the metaphor of a road for education and had images along the road of two Kenyan children growing up and completing their education. The final images depicted the positive impact these young people would have on their community which would in time have a greater impact on the global community. My primary inspiration was a quote from a student’s essay: “The future of my country depends on my best action.” I based my images on the drawings of the youth and incorporated other quotes. The staff enthusiastically approved the design and I was given two additional staff members which I had not met to help me work with the youth as they painted. When I asked what they taught at the school, they informed me that they were the kindergarten teachers. I was confused as to why they had not been a part of the meeting that morning to approve the mural seeing that this was ultimately to become their classrooms. I showed them the design and began to explain the student’s sources from which the concept had been developed. They listened and then I asked them what they thought of the design or if they wanted to make any changes. They quickly rejected the design and began to instruct me what I was to paint. They wanted a language corner with the letters and writing patterns, a mathematics corner with the numbers, a creative corner with shapes and colors, and an environmental corner showing images with their identifying words (apple, tree, baby, father, mother, road, etc). The Education Specialist from Nuru quickly stepped in and told the women that the former design had already been approved and we were moving forward. However, I was uncomfortable with proceeding and decided to end our work that day so that I could learn more about the dynamics of what was happening. I initiated a conversation with one of the lead Kenyan primary teachers, Francis, to discover more. He explained that the kindergarten teachers were not included in the design presentation initially because they are not traditionally seen as “real teachers”. All teachers in that area of Kenya are employed by the Kenyan Government but this doesn’t include early childhood educators. Nuru had chosen the renovations of the kindergarten classroom at their pilot school to specifically increase appreciation for early childhood education based on research highlighting the importance of this crucial learning time for young children. However, they had not yet realized the lack of respect that early childhood educators received culturally and therefore had not worked to include them in the plans for these renovations. I felt that this mural was becoming an opportunity to accomplish more within the dynamics of this school than the Nuru staff had originally supposed. I believed that including the input of these two kindergarten teachers in the design of the mural was crucial as they knew best what would be helpful for them in their own classroom space. I discussed their specific suggestions for changing the design with the Headmistress of the school. She explained that none of their teachers have supplies like flip charts, flashcards, or colorful posters to teach the letters and numbers. Each classroom has only a chalkboard. She agreed that having the essential lessons of kindergarten permanently painted on the wall in a creative way would be extremely helpful. I spent that night redesigning the mural to incorporate the suggestions of the kindergarten teachers while keeping some key elements that reflected the input of the students from grades 7 and 8. In the morning we had another meeting and ensured that the kindergarten teachers were present. While presenting to the staff, I acknowledge the elements suggested by the kindergarten teachers. The remaining staff were very impressed and supportive of the new changes. The kindergarten teachers were so proud. Once we began to paint, they were my most enthusiastic assistants as they began to see their own ideas come to life. We worked with a group of eight students from grades 7 and 8. Painting was a new experience for each of them. At first, they were all hesitant and painted only where we told them too. I had intentionally designated one of the walls to be a painting of their school and left it blank. Once they became a little more comfortable, I asked them to draw their own school and design the colors and surroundings. They began to make suggestions and showed me sketches of their ideas which became more and more creative. They took their ideas to the wall and began to paint. That was when the students began to sing. One of the teachers explained that it was common in their community to sing while working or playing together. Their voices blended beautiful and echoed throughout the school. They encouraged me to join them teaching me their songs in Swahili and asked me to teach them new songs. That moment of joining in song together with the students and teachers as we painted is etched in my mind as an exemplification of the power of relational art: each persons individual offering is validated and brought into a unified voice to create something beautiful.